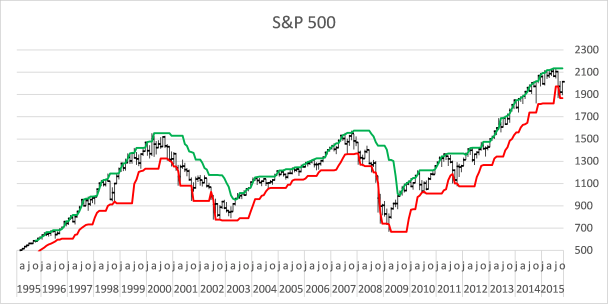 It is easy to create a stock chart in excel. 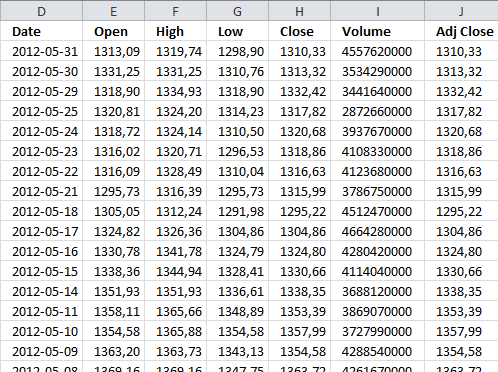 In this post I am going to describe how to insert buy and sell points. A 50 day moving average will work as an indicator. 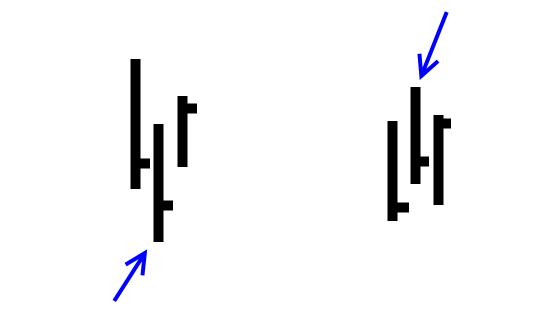 If the average changes from negative to positive a buy signal is generated and a sell signal when the average moves from positive to negative trend. It let´s you choose start, end date and interval (daily, weekly, monthly prices). 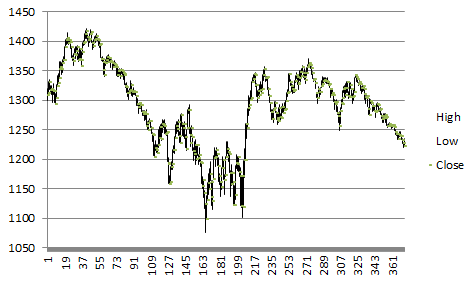 Select cell range D1:J300 and enter YahooStockQuotes(2009, 9, 1, 2012, 5, 31, "d", "^GSPC") in formula bar. Press and hold Ctrl + Shift. Press Enter. Copy cell K2 and paste down as far as needed. Copy cell L2 and M2 and paste down as far as needed. Copy cell B3 and C2 and paste down as far as needed. 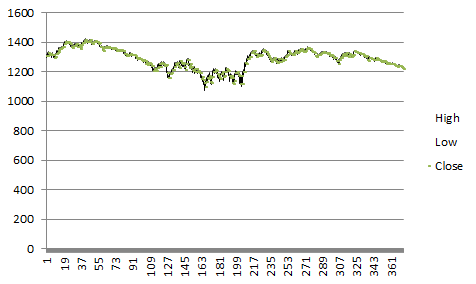 Click "High Low Close stock chart"
Click Minimum fixed and type 1050. Click Maximum fixed and type 1450. 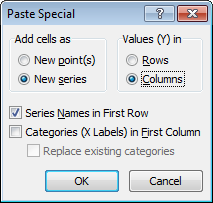 Click "Categories in reverse order"
Select cell range M2:M300 and repeat above steps. 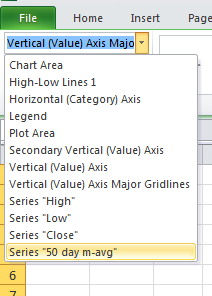 Repeat above steps with "Sell"
Change minimum and maximum values. They must match the primary axis. Click "More Data Label Options"
Your example download file shows the error message "#DIV/0!" on the: 50 day m-avg, Buy, Sell columns. Also when I tried to duplicate your instructions I got a line for both the buy and sell signals symbols on the 0 horizontal line. 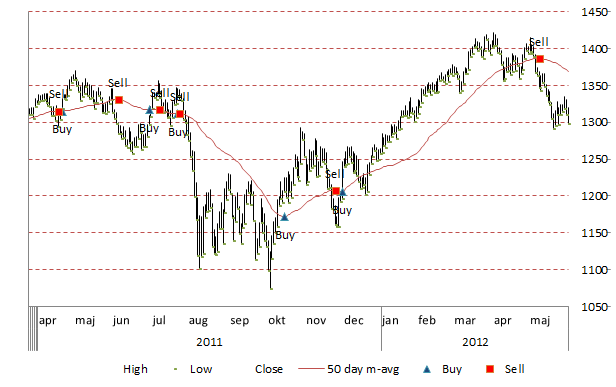 How do I get rid of the buy/sell signal symbols on the horizontal 0 line. One last thing how is it possible to change the date format to "mm dd yy"?